The Q source (also called Q document, Q Gospel, or Q from German: Quelle, meaning “source”) is a hypothetical written collection of primarily Jesus‘ sayings (logia). Q is part of the common material found in the Gospels of Matthew and Luke but not in the Gospel of Mark. According to this hypothesis, this material was drawn from the early Church’s Oral Tradition. Along with Marcan priority, Q was hypothesized by 1900, and is one of the foundations of most modern gospel scholarship. B. H. Streeter formulated a widely accepted view of Q: that it was written in Koine Greek; that most of its contents appear in Matthew, in Luke, or in both; and that Luke more often preserves the text’s original order than Matthew. In the two-source hypothesis, the three-source hypothesis and the Q+/Papias hypothesis Matthew and Luke both used Mark and Q as sources. Some scholars have postulated that Q is actually a plurality of sources, some written and some oral. Others have attempted to determine the stages in which Q was composed. Q’s existence has been questioned. Omitting what should have been a highly treasured dominical document from all early Church catalogs, its lack of mention by Jerome is a conundrum of modern Biblical scholarship. But copying Q might have been seen as unnecessary as it was preserved in the canonical gospels. Hence, it was preferable to copy the Gospels of Matthew and Luke, “where the sayings of Jesus from Q were rephrased to avoid misunderstandings, and to fit their own situations and their understanding of what Jesus had really meant”. Despite challenges, the two-source hypothesis retains wide support. For centuries, biblical scholars followed the Augustinian hypothesis: that the Gospel of Matthew was the first to be written, Mark used Matthew in the writing of his, and Luke followed both Matthew and Mark in his (the Gospel of John is quite different from the other three, which because of their similarity are called the Synoptic Gospels). Nineteenth-century New Testament scholars who rejected Matthew’s priority in favor of Markan priority speculated that Matthew’s and Luke’s authors drew the material they have in common with the Gospel of Mark from Mark’s Gospel. But Matthew and Luke also share large sections of text not found in Mark. They suggested that neither Gospel drew upon the other, but upon a second common source, termed Q.
Herbert Marsh, an Englishman, is seen by some as the first person to hypothesize the existence of a “narrative” source and a “sayings” source, although he included in the latter parables unique to Matthew and unique to Luke. In his 1801 work, A dissertation on the Origin and Composition of our Three First Canonical Gospels, he used the Hebrew letter Aleph (א) to denote the narrative source and the letter beth (ב) to denote the sayings source. The next person to advance the “sayings” hypothesis was the German Friedrich Schleiermacher in 1832. Schleiermacher interpreted an enigmatic statement by the early Christian writer Papias of Hierapolis, c. AD 95–109 (“Matthew compiled the oracles (logia) of the Lord in a Hebrew manner of speech, and everyone translated them as well he could”) as evidence of a separate source. Rather than the traditional interpretation—that Papias was referring to the writing of Matthew in Hebrew—Schleiermacher proposed that Papias was actually referring to a sayings collection of the apostle Matthew that was later used, together with narrative elements, by another “Matthew” and by the other Evangelists. In 1838 another German, Christian Hermann Weisse, took Schleiermacher’s suggestion of a sayings source and combined it with the idea of Markan priority to formulate what is now called the Two-Source Hypothesis, in which both Matthew and Luke used Mark and the sayings source. Heinrich Julius Holtzmann endorsed this approach in an influential treatment of the synoptic problem in 1863, and the two-source hypothesis has dominated ever since. At this time, the second source was usually called the Logia, or Logienquelle (logia-source), because of Papias’s statement, and Holtzmann gave it the symbol Lambda (Λ). But toward the end of the 19th century, doubts began to grow about the propriety of anchoring its existence to Papias’s account. So the symbol Q (which was devised by Johannes Weiss to denote Quelle, meaning source) was adopted to remain neutral about the connection of Papias to the collection of sayings. This two-source hypothesis speculates that Matthew borrowed from both Mark and Q. For most scholars, Q accounts for what Matthew and Luke share—sometimes in exactly the same words—but that are absent in Mark. Examples are the Devil’s three temptations of Jesus, the Beatitudes, the Lord’s Prayer, and many individual sayings. Throughout the remainder of the 20th century, there were various challenges and refinements of Streeter’s hypothesis. For example, in his 1953 book The Gospel Before Mark, Pierson Parker posited an early version of Matthew (Aramaic M or proto-Matthew) as the primary source. Parker argued that it was not possible to separate Streeter’s “M” material from the material in Matthew parallel to Mark. This burst of interest after the Gospel of Thomas’s discovery led to increasingly more sophisticated literary reconstructions of Q, and even to redactional speculation, notably in the work of John S. Kloppenborg. Kloppenborg, by analyzing certain literary and thematic phenomena, argued that Q was composed in three stages. In his view, the earliest stage was a collection of wisdom sayings involving such issues as poverty and discipleship. Then, he posits, this collection was expanded by including a layer of judgmental sayings directed against “this generation”. The final stage included the Temptation of Jesus narrative. Although Kloppenborg cautioned against assuming that Q’s composition history is the same as the history of the Jesus tradition (i.e., that the oldest layer of Q is necessarily the oldest and pure-layer Jesus tradition), some recent seekers of the Historical Jesus, including members of the Jesus Seminar, have done just that. Basing their reconstructions primarily on the Gospel of Thomas and the oldest layer of Q, they propose that Jesus functioned as a wisdom sage, rather than a Jewish rabbi, though not all members affirm the two-source hypothesis. Kloppenborg is now a fellow of the Jesus Seminar himself. But scholars supporting the three-stage Q development hypothesis, such as Burton L. Mack, argue that Q’s unity comes not only from its being shared by Matthew and Luke, but also because, in the layers of Q as reconstructed, the later layers build upon and presuppose the earlier ones, whereas the reverse is not the case. So evidence that Q has been revised is not evidence for disunity in Q, since the hypothesised revisions depend upon asymmetric logical connections between what are posited to be the later and earlier layers. If Q existed it has since been lost. Some scholars believe it can be partially reconstructed by examining elements common to Matthew and Luke (but absent from Mark). This reconstructed Q does not describe the events of Jesus’ life: Q does not mention Jesus’ birth, his selection of the 12 disciples, his crucifixion, or the resurrection. Instead, it appears to be a collection of Jesus’ sayings and quotations. Luke mentions that he knows of other written sources of Jesus’ life, and that he has investigated in order to gather the most information. While the two-source hypothesis remains the most popular explanation for the synoptic gospels’ origins, the existence of the “minor agreements” has raised serious concerns. These minor agreements are those points where Matthew and Luke agree against or beyond Mark precisely within their Markan verses (for example, the mocking question at the beating of Jesus, “Who is it that struck you?” [Luke 22:64//Matthew 26:68], found in both Matthew and Luke but not in Mark, although it should be noted that this “minor agreement” falls outside the usually accepted range of Q.) The “minor agreements” call into question the proposition that Matthew and Luke knew Mark but not each other, e.g. Luke might have indeed been following Matthew, or at least a Matthew-like source. Peabody and McNicol argue that until a reasonable explanation is found the two-source hypothesis is not viable. Secondly, how could a major and respected source, used in two canonical gospels, disappear? If Q did exist, it would have been highly treasured in the early Church. It remains a mystery how such an important document, which was the foundation for two canonical Gospels, could be lost. An even greater mystery is why the extensive Church catalogs compiled by Eusebius and Nicephorus would omit such an important work yet include such non-canonical accounts as the Gospel of Peterand the Gospel of Thomas. The existence of a treasured sayings document in circulation going unmentioned by early Church Fathers remains one of the great conundrums of modern Biblical scholarship. Pier Franco Beatrice argues that until these issues are resolved, Q will remain in doubt. Some scholars argue that the Gospel according to the Hebrews was the basis for the synoptic tradition. They point out that in the first section of De Viris Illustribus (Jerome), we find the Gospel of Mark where it should be as it was the first gospel written and was used as a source for the later gospels. Following it should be Q. But not only is Q not where it should be at the top of Jerome’s list, this treasured work recording the Logia of Christ is mentioned nowhere by Jerome.Rather, the first seminal document is not Q but the Gospel according to the Hebrews. Austin Farrer, Michael Goulder, and Mark Goodacre have also argued against Q, maintaining Markan priority, claiming the use of Matthew by Luke. This view has come to be known as the Farrer hypothesis. Their arguments include: Farrer, in his 1955 paper that first outlined this hypothesis, notes that when we find two documents that contain common material, identical in the words and phrases they use to describe some scenes, the simplest explanation is that one of the two used the other as a source, rather than both using a third document as a source. Goulder points to common Matthean phrases such as “brood of vipers”, “make fruit”, and “cast into the fire” that each appear in Luke only once, in a Q passage. Goulder’s conclusion, based on writing styles, is that Matthew is the source for these “Q” sayings. Goodacre notes that there is no extant copy of Q and that no early church writer makes an unambiguous reference to a document resembling the Q that modern scholars have reconstructed from the common material in Luke and Matthew. While supporters say that the discovery of the Gospel of Thomas supports the concept of a “sayings gospel”, Mark Goodacre points out that Q has a narrative structure as reconstructed and is not simply a list of sayings. All Wisdom, All Love, All Power, is spirited by the Soul Intelligence, is the I AM I ever present Being-ness in the Universe. One Infinite Mind constantly connects all people to the One Ever Present Power. People is the awareness of being One Energy freely infinitely expressing wholeness. Looped this cool video of the 300,000 birds a few times because it seemed to suit the song. At the center of a galaxy more than 55 million light-years away, there’s a supermassive black hole with the mass of several billion suns. And now, for the first time ever, we can see it. Astrophysicist Sheperd Doeleman, head of the Event Horizon Telescope collaboration, speaks with TED’s Chris Anderson about the iconic, first-ever image of a black hole — and the epic, worldwide effort involved in capturing it. Learn more about the Event Horizon Telescope and how it captured the first direct image of a black hole. This could push some of us to the brink, if we realize that it is no longer workable to continue pretending that an imbalance is acceptable or even tolerable. Whether or not we can speak that truth externally is probably less vital than knowing for ourselves that untenable differences exist and that they have simply become too much. In a relationship, we may experience being too far apart from the other person. With work ethics, committees, or mentoring setups, we might observe a lack of sufficient common ground. Despite the Libra Moon’s love of agreement, it could be easier to feel different now, since the Sun is conjunctUranus, reminding us that each individual is unique. Uranus is the planet of the outsider, often in the minority. Yet our uniqueness also reflects individual value, and therein lies a contradiction: Who decides where value lies? We live in societies that emphasize popularity through the affirmation of large numbers of people. Ultimately, however, we must each decide what and whom we value. And nobody can instill a stronger sense of worth in us than we ourselves. Therefore, even if others stand opposed to us now, we can know that we represent something special that has its own merit. The outsider theme of Uranus conjunct the Sun is even more highlighted because the conjunction is dissociate, or out of sign: Uranus, transiting a different zodiac sign from the Sun in Aries, is in the neighboring sign of Taurus. Sometimes, we have a good motive for working to get along with our neighbors. Other times, though, we feel like the misfit among those who have a different set of habits or beliefs. While we may seem to be outnumbered, what we hold is precious in its own way and, in true Taurus style, should be carefully protected. One way of providing such protection could be to move away from the environment that’s making us feel “odd” and head, instead, towards something more nurturing for our specific lifestyle values. This may involve a different community, or it might revolve around a particular building, or even getting closer to nature, considering that Taurus is a sign that is often linked with earthy structures. Perhaps it is in this different place that we find our true peace and inner harmony. The Libra Full Moon, in a sticky t-square with Pluto, speaks to an issue around power — or the lack of it. Someone may want to attribute power to us that we don’t feel we really have. Or, conversely, we feel disempowered through a situation that overwhelms us. Either way, the dynamic,cardinal nature of this t-square represents taking action. Pluto pulls the South Node and Saturn into the t-square, simply by being close by in Capricorn, and the South Node between both planets indicates that power and control issues are rooted in patterns of the past. Sometimes, there is an abusive situation that has been hidden under the shadows of Pluto. This kind of scenario may continue because other people are not able to witness these incidents in the light of day or because they are so far from the expectations and norms of most people that no one would even have imagined them. Still, some insight into the circumstances could well come to light, finally, under the current Full Moon — perhaps not a minute too soon, given the late degree of that Moon. There is a sense of good fortune and blessings abounding, since the Moon is sextile Jupiter in Sagittarius. For individuals, the Uranian and Jupiterian message here is to not ignore something vital and potentially life-giving — it could be a suddenly open door, an opportunity to see more clearly or speak the truth, or any special chance to escape a limiting, imprisoning, unfair, or otherwise disempowering situation. Therein lies a route to freedom! On my departure I still admitted much that was fantastic in relation to schools. “Admitted” is perhaps too strong a word. I should say better that I dreamed about the possibility of a non-physical contact with schools, a contact, so to speak, “on another plane.” I could not explain it clearly, but it seemed to me that even the beginning of contact with a school may have a miraculous nature. 1 imagined, for example, the possibility of making contact with schools of the distant past, with schools of Pythagoras, with schools of Egypt, with the schools of those who built Notre-Dame, and so on. MANY strange thoughts have always been evoked in me by the view from the top of the towers of Notre Dame. Looking down from these towers you feel that the real history of humanity, the history worth speaking of, is the history of the people who built Notre Dame and not that of those passing below. And you understand that these are two quite different histories. One history passes by in full view and, strictly speaking, is the history of crime, for if there were no crimes there would be no history. All the most important turning-points and stages of this history are marked by crimes; murders, acts of violence, robberies, wars, rebellions, massacres, tortures, executions. Fathers murdering children, children murdering fathers, brothers murdering one another, husbands murdering wives, wives murdering husbands, kings massacring subjects, subjects assassinating kings. This is one history, the history which everybody knows, the history which is taught in schools. The other history is the history which is known to very few. For the majority it is not seen at all behind the history of crime. But what is created by this hidden history exists long afterwards, sometimes for many centuries, as does Notre Dame. The visible history, the history proceeding on the surface, the history of crime, attributes to itself what the hidden history has created. But actually the visible history is always deceived by what the hidden history has created. So much has been written about the Cathedral of Notre Dame, and so little is actually known about it. One who has never tried to find out anything about it for himself, or to make something out of the material available, would never believe how little in fact is known about the building of the cathedral. It took many years to build; the dates when it was begun and when it was finished are known; the bishops who, in one way or another, contributed to this construction are also known, and so are the popes and kings of that time. But nothing has remained concerning the builders themselves with the exception of names, and even that seldom. 1 And no facts have remained concerning the schools which stood behind all that was created by that strange period. It is known that there existed Schools of Builders. Of course they had to exist, for every master worked and ordinarily lived with his pupils. In this way painters worked, in this way sculptors worked. In this way, naturally, architects worked. But behind these individual schools stood other institutions of very complex origin. And these were not merely architectural schools or schools of masons. The building of cathedrals was part of a colossal and cleverly devised plan which permitted the existence of entirely free philosophical and psychological schools in the rude, absurd, cruel, superstitious, bigoted and scholastic Middle Ages. These schools have left us an immense heritage, almost all of which we have already wasted without understanding its meaning and value. 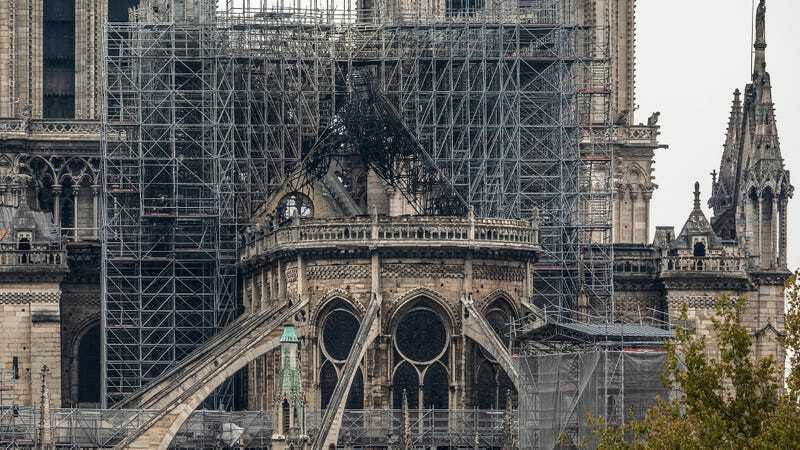 In the voluminous records of the church of Notre Dame, which go back beyond the 12th century, there is not a single word about the actual work of the construction of the cathedral. According to the chronicles of the period before the Gothic the libraries of monasteries were foil of descriptions of the construction of their buildings and of the biographies and praises of their builders. But with the coming of the Gothic period suddenly all became silent. Until the 12th century there is no mention of any of the architects.” (From a book by Viollet-le-Duc.) These schools, which built the ” Gothic ” cathedrals, concealed themselves so well that traces of them can now be found only by those who already know that such schools must have existed. Certainly the Catholic Church of the 11th and 12th centuries, which already used torture and the stake for heretics and stifled all free thought, did not build Notre Dame. There is not the slightest doubt that for a time the Church was made an instrument for the preservation and propagation of the ideas of true Christianity, that is, of true religion or true knowledge, which were absolutely foreign to it. And there is nothing improbable in the fact that the whole scheme of the building of cathedrals and of the organisation of schools under cover of this building activity was created because of the growing ” heretic-mania ” in the Catholic Church and because the Church was rapidly losing those qualities which had made it a refuge for knowledge. By the end of the first thousand years of the Christian era the monasteries had gathered all the science, all the knowledge, of that time. But the legalisation of the hunting and prosecution of heretics, and the approach of the Inquisition, made it impossible for knowledge to reside in monasteries. There was then found or, to speak more accurately, created, for this knowledge a new and convenient refuge. Knowledge left the monasteries and passed into Schools of Builders, Schools of Masons. The schools within presented a complex organisation and were divided into different degrees; this means that in every ” school of masons ” where all the sciences necessary for architects were taught there were inner schools in which the true meaning of religious allegories and symbols was explained and in which was studied ” esoteric philosophy ” or the science of the relations between God, man and the universe, that is, the very ” magic “, for a mere thought of which people were put on the rack and burnt at the stake. Notre Dame has remained, and to this day guards and shows us the ideas of the schools and the ideas of the true ” freemasons “. Such, for instance, is the tall, slender, pierced spire over the eastern part of the cathedral, from which the twelve Apostles, preceded by the apocalyptic beasts, are descending to the four comers of the world. The whole scenic effect which was undoubtedly a part of the builders’ design. The spire with the Apostles is an inseparable part of this view. You stand on the top of one of the big towers and look towards the east. The city, the houses, the river, the bridges, the tiny, microscopic people. . . . And not one of these people sees the spire, or sees the Teachers descending upon the earth preceded by the apocalyptic beasts. This is quite natural, because from there, from the earth, it is difficult to distinguish them. If you go there, to the embankment of the Seine, to the bridge, the Apostles will appear from there almost as small as the people appear from here, and they will merge into the details of the roof of the cathedral. They can be seen only if one knows of their existence, like so many other things in the world. But who cares to know? And the gargoyles? They are regarded either simply as an ornament, or as individual creations of different artists at different times. In actual fact, however, they are one of the most important features of the design of the whole building. This design was very complex. To be more exact, it is not even one design, but several designs completing one another. The builders wished to put all their knowledge, all their ideas, into Notre Dame. You find there mathematics, astronomy; some very strange ideas of biology’ or ” evolution ” in the stone bushes, on which human heads grow, on the balustrade of the large platform under the flying buttresses. The gargoyles and other figures of Notre Dame transmit to us the psychological ideas of its builders, chiefly the idea of the complexity of the soul. These figures are the soul of Notre Dame, its different ” I “s: pensive, melancholy, watching, derisive, malignant, absorbed in themselves, devouring something, looking intensely into a distance invisible to us, as does the strange woman in the headdress of a nun, which can be seen above the capitals of the columns of a small turret high up on the south side of the cathedral. The gargoyles and all the other figures of Notre Dame possess one very strange property: beside them people cannot be drawn, painted or photographed; beside them people appear dead, expressionless stone images. It is difficult to explain these ” I “s of Notre Dame; they must be felt, and they can be felt. But it is necessary to choose the time when Paris becomes quiet. This happens before daybreak, when it is not yet quite light but when it is already possible to distinguish some of these strange beings sleeping above. I remember such a night; it was before the war. I was making a short stay in Paris on the way to India and was wandering about the town for the last time. It was already growing light, and the air was becoming cold. The moon moved swiftly among the clouds. I walked round the whole cathedral. The huge massive towers stood as though on the alert. But I already understood their secret. And I knew that I was taking with me a firm conviction, which nothing could shake, that this exists, that is, that there is another history apart from the history of crime, and that there is another thought, which created Notre Dame and its figures. I was going to search for other traces of this thought, and I was sure that I should find them. Eight years passed before I saw Notre Dame again. These were the years of almost unprecedented commotion and destruction. And it seemed to me that something had changed in Notre Dame, as though it was beginning to have a presentiment of its approaching end. During these years, which have written such brilliant pages into the history of crime, bombs dropped over Notre Dame, shells burst, and it was only by accident that Notre Dame did not share the fate of that wonderful fairy-tale of the twelfth century, Rheims Cathedral, which perished a victim of progress and civilisation. And when I went up the tower and again saw the descending Apostles I was struck by the vainness and almost complete useless-ness of attempts to teach people something they have no desire whatever to know. And again, as many times before, I could find only one argument against this, namely, that perhaps the aim both of the teaching of the Apostles and of the construction of Notre Dame was not to teach all the people, but only to transmit certain ideas to a few men through the ” space of time “. Modern science conquers space within the limits of the surface of the small earth. Esoteric science has conquered time, and it knows methods of transferring its ideas intact and of establishing communications between schools through hundreds and thousands of years. The full moon 19 April 2019, falls at 29º Libra decan 3. The full moon april 2019 astrology is aligned with fixed star Izar in the constellation of Bootes the Herdsman. The closest aspect to the full moon is an opposition to Uranus. The tarot card is the 4 of swords and the healing crystal will be the Sunstone. The full moon April 2019 in Libra is extremely sensitive to the collectives’ emotions. That means those touched by this full moon can adjust themselves to suit their audience. The success of the fixed stars here brings even more likelihood of one being able to tap into the zeitgeist. The April full moon has great business sense and is able to capitalize on this greatly. However, as far as dignity goes, the Moon has no real power in Libra decan 3 and even feels quite uncomfortable. At some point, while the Moon is here then, there could be a danger of someone or some group falling out of favour and of even being placed in exile. In my research for Moon in Libra decan 3, I did find literal cases of exile (Wallis Simpson.) and also cases of downfall after great status (Marie Antoinette.) In Libra 3 the Moon is defined as Peregrine. When a planet is peregrine, it is essentially in exile, so the status of an outlaw or anti-hero fits this full Moon very well. This decan, in particular, shows strongly the archetype of Eris/Venus Lucifer (as the Morning star.) Will Lady Lucinda shed some light on the confusion in the world right now? Moon opposite Uranus is going to cause a stir in the collective. The electric and volatile energy of Uranus seems to become even more unstable than usual in opposition. The polarity creates wild mood swings and has the feel of a loose cannon. In my research, it was sad to see that three accidents/assassinations are in the list of the natives who were born with this aspect and all of three deaths caused a huge public outpouring of emotion whether it be anger, shock or deep mourning. The revolutionary energy of Uranus though, means that after the lightning bolt has struck, things are never the same again. With this aspect there is the feeling that something is just about to flip out, so we will feel like we must be ready to jump ship very quickly. This is the second full moon in Libra in a row which is quite rare. This is because the last one was right at the dawn of Libra decan 1 whereas this one is as the very last degree of decan 3. The 29º is known as an anaretic degree which in astrology means that it is extremely unstable. It is like being at the very end of a process in alchemy just about to regenerate into something else. The move is from Venus to Mars energy as we move to the next full moon in Scorpio. To me this makes me think of the whole Brexit debacle where change is being resisted in the hope the outcome will swing the other way. But resisting transformation is a dangerous game as the more you push it down the harder the counter-reaction will be. Bootes is the guardian of the people or he can simply be a herdsman of sheep. Maybe some of the El-ites regard their flock as airheads they can just bark at and they will flee to their enclosures. But all it takes is an renegade sheepdog and the shepherd loses control of the whole flock. The unpredictable energy of Uranus only adds to the instability and it is interesting that the tarot card associated with this decan warns of a sudden breakdown due to overwork. Is Bootes overworking the herd? Will the herds turn on their masters? The shift from obedient, passive Venus to aggressive Mars is shown at this full Moon which in itself is an opposition of signs ruled by Venus and Mars. Uranus, however, is in a Venus-ruled sign, but one that is associated with the earth and agriculture as Bootes is. I wonder if there is be a farmers revolt of some kind. A quick word about the use of the word ‘s*d*my in the “3rd face of Libra” phrase. This is from the Roman translation of the Picatrix and the Arabic is exactly the same. Why they combine ‘evils’ with joy is anyone’s guess, but I would imagine this is the side of Venus which can easily become exceedingly self-indulgent and narcissistic if not kept in check. Despite the grim prognosis of the 3rd face of Libra, I still think the overall message is one of hope and positivity. Sometimes things have to reach a boiling point before transformation can happen. It’s all about cycles. The universe is intelligent. Humans are blood cells. We are self-correcting. I chose the image of Washington in hell rather than the 3rd face of Libra. I liked the image better and it seems very relevant for the current times. With Bootes, we are also talking about guardians in the shape or our leaders, and how important their health is for the state of the nation as a whole. The government is weak and sick, it needs to go. Rant after about 10 mins talks about stupid celebrity tweets and why are most artists/entertainers left-leaning?